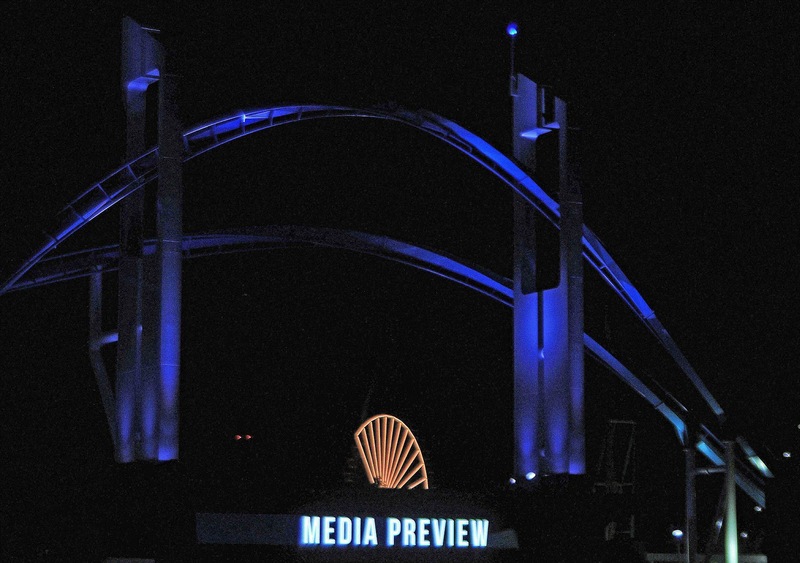 Driving in before sunrise, Cedar Point is already generating excitement for the 2013 Opening Day. Snoopy shows you where to turn off Highway 6 onto the Richard L Kinzel Causeway to get to Cedar Point. This dramatic lighting will distract guests from the open view of the beach after dark. The first train of riders screams through the darkness, just as we approached the new gate. The sign says it all, this is the reason we all got up so early. 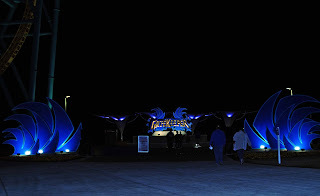 It was reported that over 1200 roller coaster enthusiasts and 400 media members were registered for the opening of Gatekeeper. Thankfully, the Cedar Point ride operators were up to the task, for the line moved continously all the while the ride was in operation. 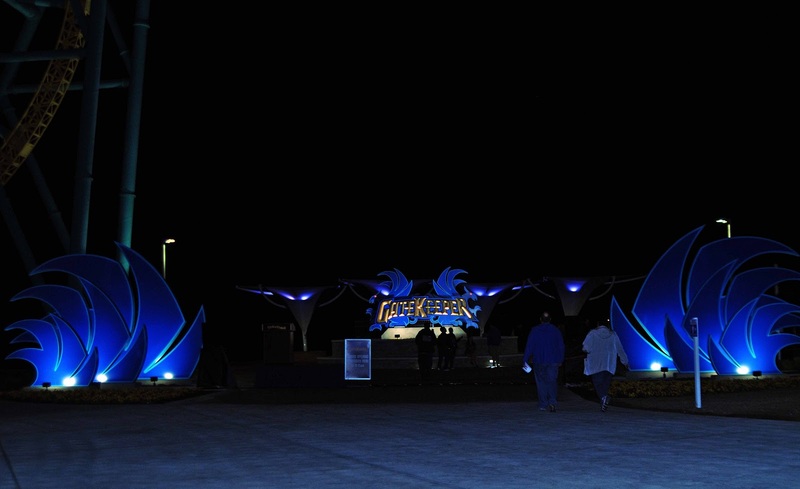 The double keyholes above the turnstiles are a first for any wingrider roller coaster. The track reaches from close to Blue Streak and almost to the beach. 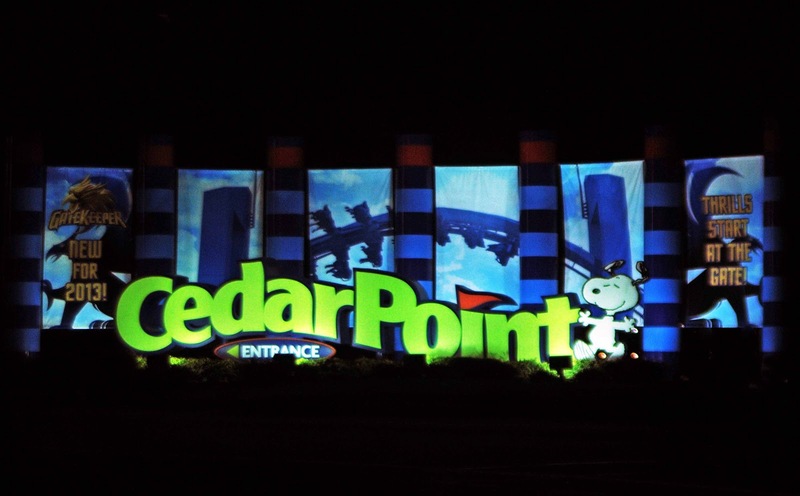 Above is a short interview with Rob Decker, the leader of the team that transformed the entrance to Cedar Point. Anyone who wanders through the gate will know just what is in store past the turnstiles. You all did a great job! Signs like this directed us through the park, and they look so much better in daylight. This inversion prior to the first drop, 170 feet in the air, is the tallest inversion in the world. The train quickly accelerates to the maximum speed of 67 mph. 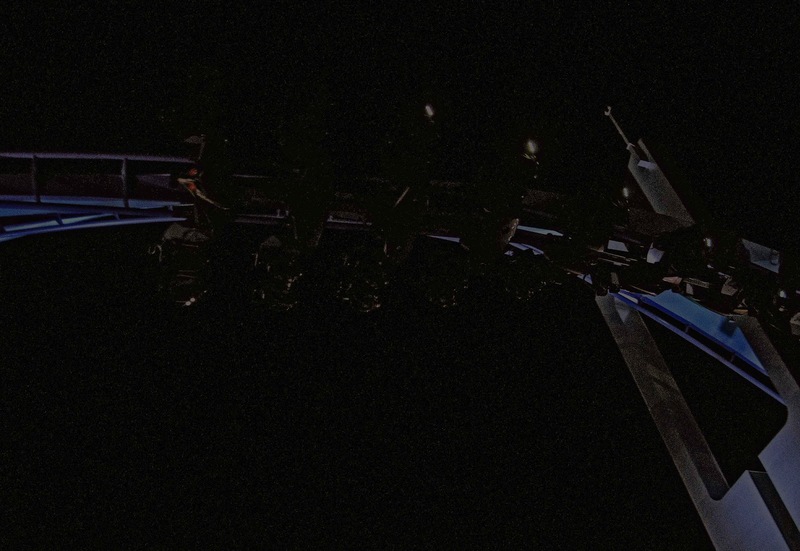 This shot of the train featuring one of the many floating moments during the ride shows how the riders are suspended in the air beside the track and also the face of the Gatekeeper. His eyes glow red after dark, with additional accent LEDs on the side of the cars. 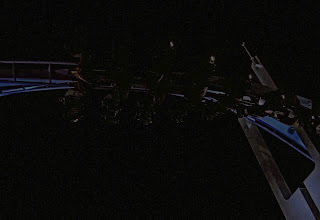 Passing through the second, the train articulates to a great degree since the end of the train is still inverted on the other side. And you didn't ask, but the reason the towers are slit through the middle is to keep the bolts exposed for inspection purposes. Otherwise someone would have to climb ladders inside the towers to inspect the bolts for tightness. There are over 10 thousand bolts that have to be monitored on Gatekeeper. The return behind the keyholes features a barrel roll with a great headchopper. Since we never watch POV prior to riding a coaster, this was a nice surprise to us on our first ride. Another question you didn't ask; How long is the wire from the controller motor to the control panel? The answer is 983 feat, provided by the guys from Firelands Electric. They also said that a tremendous amount of the cabling was done underground, because the park want keep a clean appearance on the ride. Interesting facts to know, if you like that stuff. Here the riders are above and beyond the picnic area to the left of the gate. and other times riders dive close to the ground which heightens the sensation of speed. 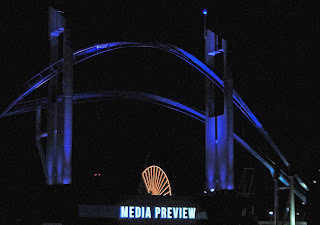 This photo shows how the on-ride video was mounted in the front seat for the video of us that you can watch below. We rode it in the front and back, but for our tastes, the best seats are on the lake side as you load in the station. You miss the lake view, but the flip into the first drop is exhilarating. You need to go ride this one, only at Cedar Point. 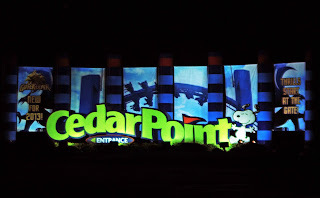 Many thanks to Brian, Rob, John, and Annie, plus everyone else at Cedar Point for their help in bringing you this report. Special thanks also to the crew from Firelands Electric, because they must have seemed like dumb questions to you who know better but I was curious. Now, everyone else go get in line, because this is an experience not to be missed!